Do you often forget simple words and phrases? Do you find yourself walking into a room only to forget what you originally wanted? Do you frequently lose your train of thought mid-sentence? Have you started to stutter, especially in the company of other adults? Do you find yourself tripping over the simplest Dr. Suess pages, especially at night time? If you answered "yes" to any of these questions, you might be suffering from a condition known as Mommy Brain. Preventative Care: Don't have children. However, if it's too late for that option, there are steps you can take to alleviate-- but not completely cure-- the most troubling symptoms. 1. Drink plenty of coffee. This is as necessary as water in temporarily suppressing the symptoms of Mommy Brain. Recommended intake: 2-5 cups daily. 2. Consider at least occasionally sleeping in the basement, or as far from your children as possible, in order to reach that elusive REM sleep you keep reading about. 3. Whenever possible, roll down the windows of your minivan to allow fresh oxygen to reach the foggy recesses of your brain. 4. Do not read more than 2 storybooks per night to your children or you will be at risk for increased slurring and stuttering. 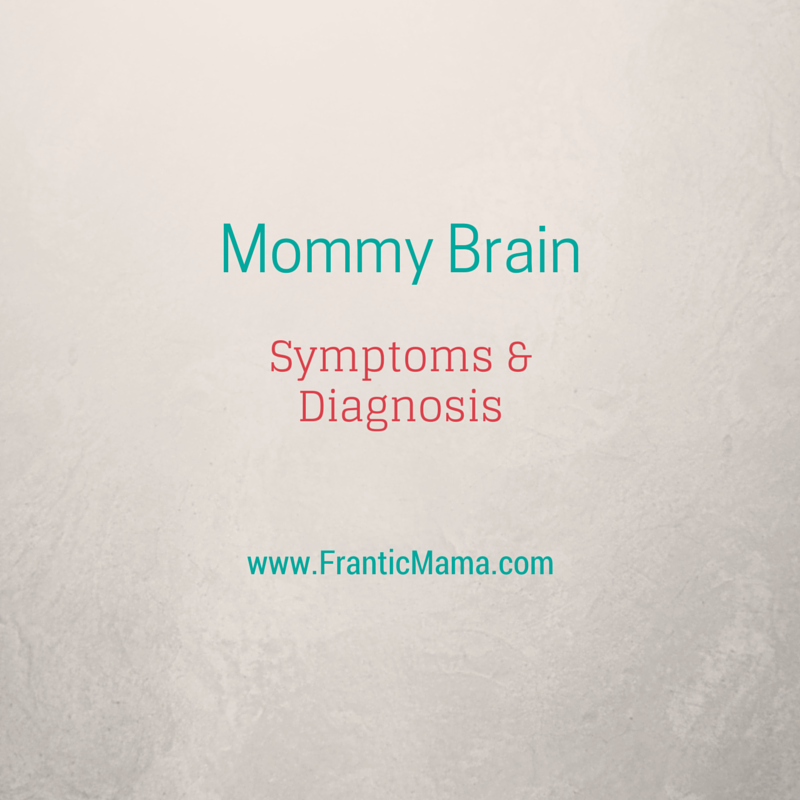 We are always interested in collecting more anecdotal evidence to support the Mommy Brain prognosis. Please share your own history with Mommy Brain as well as any tried-and-true home remedies in the Comments. Find me on Top Mommy Blogs, here, and just click Frantic Mama to vote for me :). This is great! I am so there! Thanks for sharing! Fellow sufferer here. I attempted to sleep in the basement with the white noise app (which I originally downloaded for my infant when she was a newborn), only to have it completely backfire. Instead of sleeping soundly, I was stressed out and tossing and turning b/c I couldn't tell whether the baby was still crying or not. Awesome. Oh, I can so see how sleeping far away from the baby could backfire! I was so tired a few times with my second that I was able to sleep for a couple of nights down there while my husband was on call with the baby... but it took getting used to :).